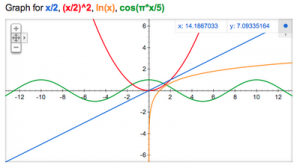 Google has introduces graphing calculator’ functionality to its search bar. If a user queries a mathematical function on Google the SERPS will now return an interactive graph representing the function entered. Try out simple sin(x) geometric functions or complex equations, trigonometric, exponential, logarithmic and their compositions.